In this fast-paced world, we are always looking for a way to shorten tasks and make the most of enjoying our days. With the ever growing variety of shower gels in the market, finding the most suitable one need not be a headache. How? 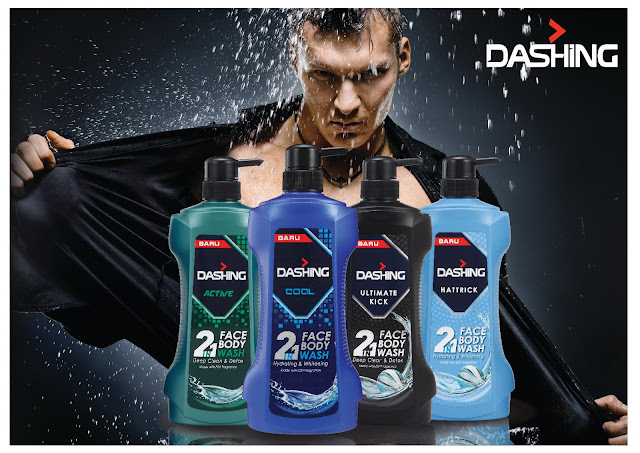 With DASHING 2 in 1 Face & Body Wash, the formula that is designed perfectly for both your face and body! Maintaining a hygienic daily routine is great for cleanliness and self-confidence. 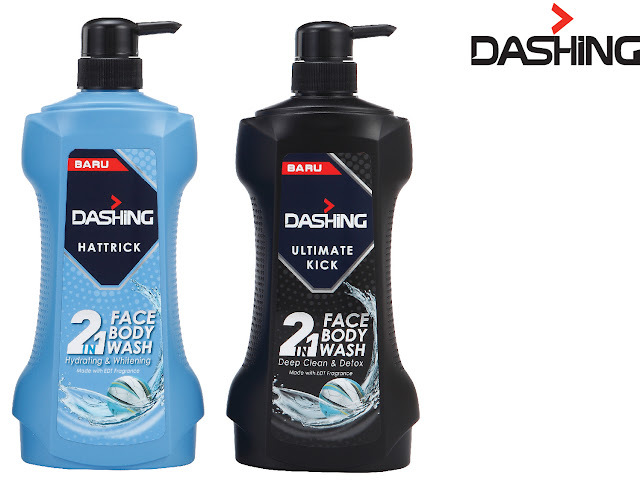 Finding the ideal shower gel helps in leaving your skin clean and smooth by opening up pores and removing toxins. 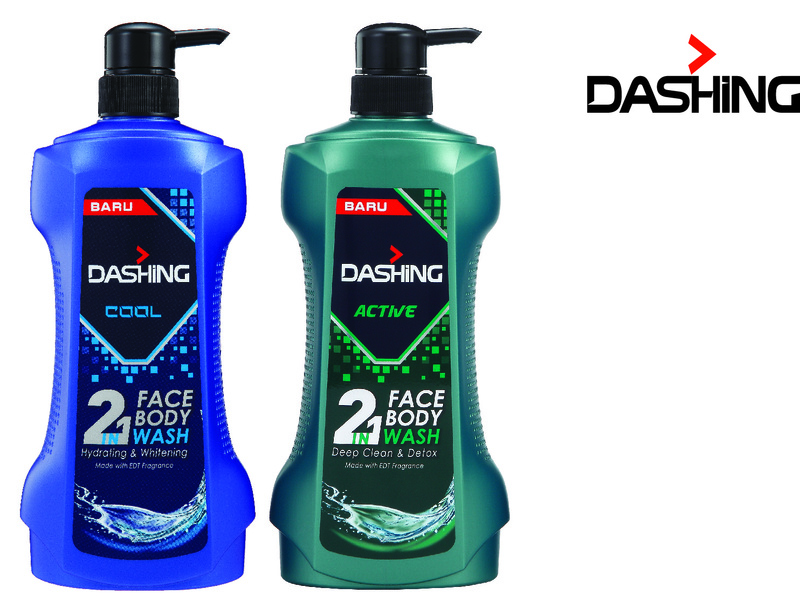 DASHING 2 in 1 Face & Body Wash, offers a complete clean and an energising sense of freshness from head to toe — without irritation. And, with the modern men nowadays, they take grooming more seriously. Washing the face is one of those things we assume everyone does the same way. 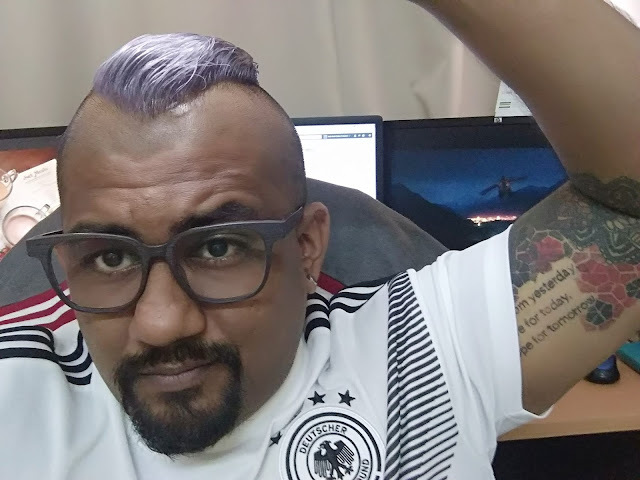 With that being said, a guy should wash their face twice a day – when he wakes up in the morning and before he goes to bed, just like taking a bath. 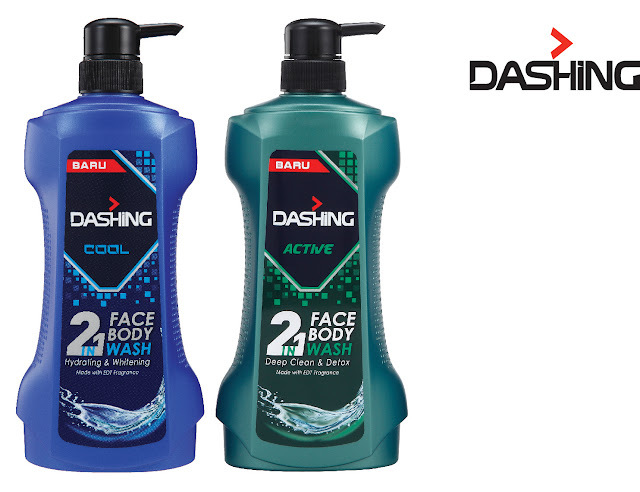 Washing your face before you take on the day ahead helps to freshen you up and prevents excess oil production. Cleansing at the end of the day will remove all the impurities that your skin faces from the pollution, humidity and dirt. Therefore, to make the process of washing the face and body more efficient, DASHING has the perfect solution for you – DASHING 2 in 1 Face & Body Wash. This face and body wash comes in a 700-gram convenient pump pack design. It’s specially formulated for men’s face and body to hydrate and whiten the skin. Loaded with ingredients to detoxify the skin and deliver deep-cleansing action from face to toe leaving you clean and fresh all day. 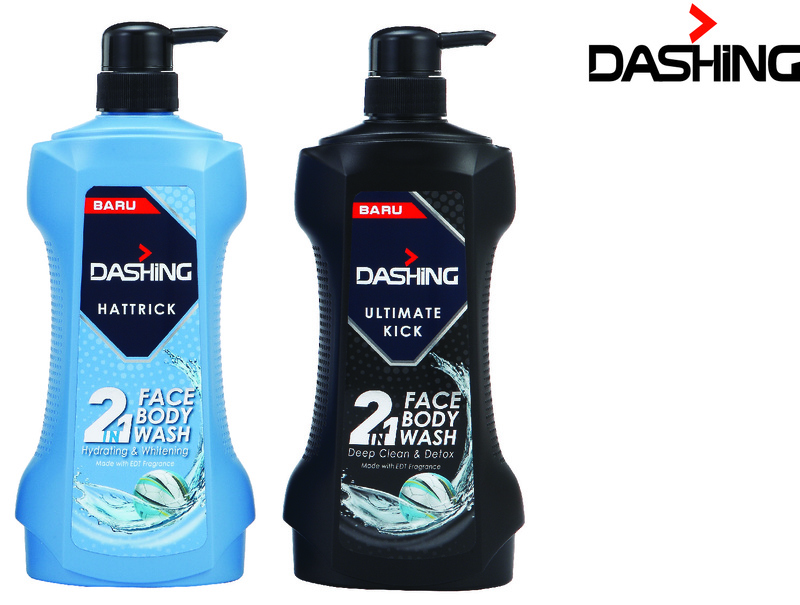 The DASHING 2 in 1 Face & Body Wash is available in 4 variants; Cool, Active, Hattrick and Ultimate Kick. Infused with the eau de toilette (EDT) perfume, it gives a long-lasting fragrance to suit a men’s scent. 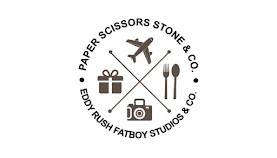 Cool serves the contemporary man who is nonchalant, loves to hang around with his friends and takes life easy. This masculine fragrance defines one’s identity and magnetism. A cool fresh scent topped with a captivating blend of bergamot and galbanum whilst accented with powdery amber and musk as base note. This scent is designed to exude the cool masculine charm within oneself. The Active is staunched to the rugged men on-the-go who are passionate about life in the outdoors. Topped with modern fougére nuances combined with a bright citrus top note, lavender, muguet heart and a novel amber background. This scent is bound to keep any men confident and active on his toes with his incredible masculine fragrance. 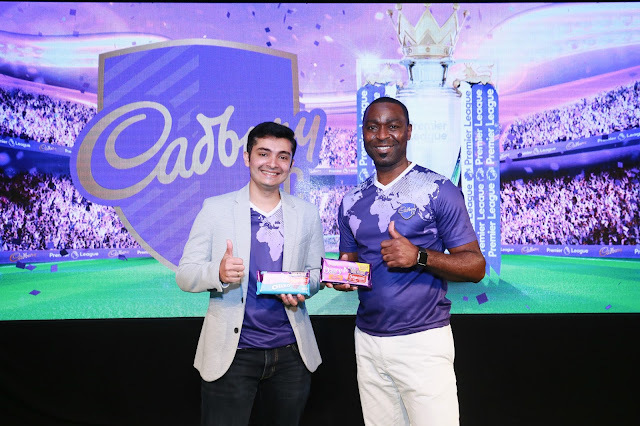 A winning strike for every DASHING man, Hattrick’s enigmatic fragrance ignites one’s love for winning goals. Hattrick exudes the unique combination of apple and citrusy freshness, infused with floral notes and a hint of amber. The Cool and Hattrick has a dual-action formula with triple whitening actives that gently and effectively cleanses to give your face an even skin tone and brighter look. On the body, its hydrating formulation which contains micro-minerals helps to improve skin moisturisation and strengthen the skin’s defence system, leaving the body feeling healthier and fresh. As for the Active and Ultimate Kick variant, it helps to remove impurities and excess oil to give your face a clear and matte look. With its deep clean and detox properties, it helps prepare the skin against daily aggression, leaving your body with a great after-shower feeling. 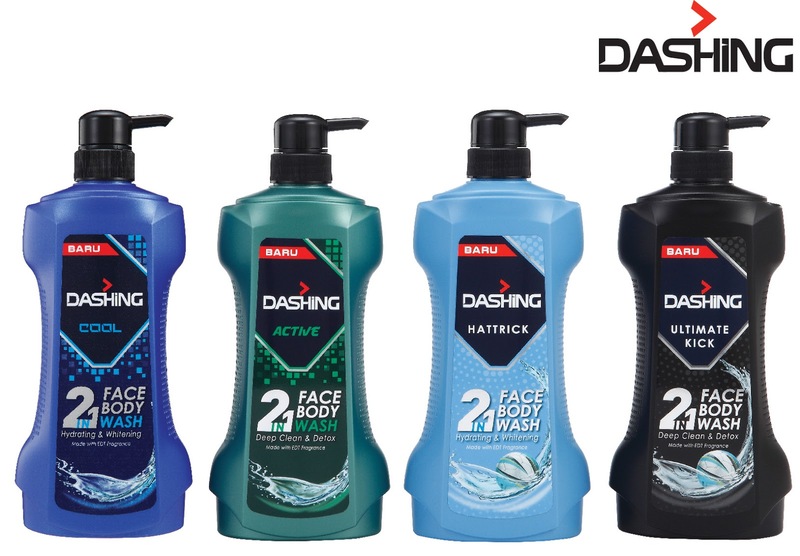 The DASHING 2 in 1 Face & Body Wash is priced at RM17.90 and is easy on the pocket as you save your money by getting 1 product for your face and body.